NASA's sharp-eyed Lunar Reconnaissance Orbiter is gearing up to look down on the Apollo 11 landing site – the location of the first human foray to the moon 40 years ago this month. Along with carrying out lunar science jobs, the moon-circling probe in coming days, weeks and months will photograph selected lunar targets, zooming in on a short list of Apollo landing locales to see the final resting spots of robotic spacecraft, moon buggy tracks and crashed rocket stages, SPACE.com has learned. The Lunar Reconnaissance Orbiter (LRO) is already on duty and using its LRO Camera, dubbed LROC for short. One large item that should be easy to spot is Apollo 11's Eagle descent stage, left behind after Neil Armstrong and Buzz Aldrin rocketed away from Tranquility Base. For the Apollo 11 site, "you will definitely see this square thing sitting on surface," said LROC's Principal Investigator, Mark Robinson of Arizona State University in Tempe. At low sun it's likely that the lander legs will cast shadows. "It will be unambiguous that the descent stage is sitting there," Robinson said. The descent stages of other Apollo missions should be visible, too. And the orbiter will look for Apollo Lunar Surface Experiment Packages (ALSEP) – an array of scientific devices deployed on the lunar surface by Apollo moonwalkers. "I know we'll see the descent stages…and I know we'll be able to find the ALSEPs," Robinson told SPACE.com. "You'll see things sitting on surface." Churned-up lunar regolith, the tracks of the three lunar rovers used during the Apollo program, should also be visible. 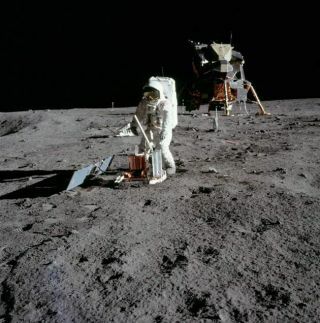 Lunar archaeologists, interested in making the Apollo 11 site a National Historic Landmark, hope the planned photos will answer some of these longstanding questions: What is the condition of Tranquility Base after 40 years? Was the American flag blown over on the Eagle's ascent and is it now a bleached skeleton? What are the relatively long term effects of the lunar environment on human artifacts? Using LRO to find surplus hardware on the moon will become even easier once the spacecraft is lowered closer to the moon, reaching a primary mapping orbit some 30 miles (50 kilometers) above the rugged lunar terrain. And there's a bit of moonwalking mystery that LRO might be able to resolve. During the Apollo 14 expedition, Alan Shepard and Edgar Mitchell tried to walk to the rim of Cone Crater, dragging with them a two-wheeled tool cart. But getting to the feature proved elusive. As time and oxygen dwindled for the twosome, their quest was called off by Earth control. To this day, just how close they got to Cone Crater is unknown. On Robinson's LRO to-do list is identifying where the Apollo 14 crew had to turn back in relationship to Cone Crater – by imaging the area and possibly the tracks left behind by the tool cart, he said. Taking the something old, something new approach is the Lunar Orbiter Image Recovery Project, located at the Ames Research Center in the heart of California's Silicon Valley. This team effort is led by Dennis Wingo of SkyCorp, Inc. in Huntsville, Alabama and Keith Cowing of SpaceRef Interactive, Inc. of Reston, Virginia. The recovery project involves culling through some 1,700 images taken by NASA Lunar Orbiter missions from the 1960's, convert that data into digital form and then reconstruct the images to yield 21st century pictures far superior than the originals. The Apollo sites themselves are extremely well characterized thanks to human explorers dispatched to those individual locales, Schmidt noted. LRO images of these areas will let us see the landers -- and likely other artifacts such as the lunar buggies used in the Apollo 15, 16, and 17 missions – all of which will no doubt be very powerful in ways beyond mere science, he said. Schmidt added that we may well see new craters and other changes in the lunar surface which can lead to a better appreciation of the cratering rates on the moon. "This rate of change information is something I can't imagine getting any other way," he said. "We have a unique opportunity here, to compare the moon's recent past with the present," Schmidt said. "What's happened on the moon in the four decades between the Lunar Orbiter and Apollo programs…and the new images we're getting from LRO? We don't know the answer yet, but the insights we'll get will be very important and enormously exciting to the scientific community," he told SPACE.com.